As the 30th anniversary nears it is time to reassess not just the current tensions between Argentina and the UK over the islands but also what is being done, given the governments steadfast commitment to keeping the islands, to ensure their defence and long term future. Of all the sources for the heightened emphasis on the islands, by parties on both sides of the Atlantic, the anniversary itself is just one reason; drilling for oil off the islands is a big bone of contention as is the presence of the heir to the British throne in the same year. Irrespective of the rights to or contested claims over the Islands in this anniversary, it is worth taking the time to consider how much the military-strategic situation has changed. 30 years ago, taken by surprise and woefully unprepared, the Falklands War defined a prime minister and scarred the memory of the armed forces and the nation. In the 1982 conflict the British government had been far from clear with regards to British attitude to the Falklands – far from making it clear that the Falklands would not be lost at any price, the political and diplomatic indicators all suggested a lack of commitment to the island. In addition, the intelligence capacity of Britain in South America, and particularly with regards to the Military Junta ruling Argentina was woefully inadequate. Additionally the military technology and capacity for defending the islands was limited, indeed British forces landed to re-take the island 7 weeks after the first landing of Argentine forces. What followed was short but bloody land conflict which eventually led to the recapture of Stanley by the British on the 14th June. 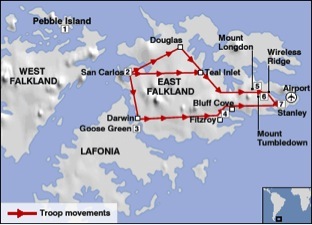 Map of British troop movements in the 1982 Falklands Conflict. The military situation of the Falklands today is incomparable-taking the island by force would be an almost impossible and at least highly improbable turn of events. Today it is defended through sophisticated intelligence networks, fighters, an extended airstrip and a range of military technology that are not just comparable with their Argentian counterparts but generations ahead. The Director-General of RUSI Michael Clarke illustrates the transformed military equation stating that ‘asking whether Britain can still beat Argentina in a Falklands conflict is a bit like worrying whether defence cuts have made it impossible to beat Germany at El Alemein.’ Ultimately it is all the rhetoric and not-so-diplomatic exchanges, including the heated exchanges last summer when after restating British commitments to the islands so long as they ‘want to remain sovereign British territory’ his argentine counterpart called him ‘arrogant’ and characterised the British position as ‘stupidity’. The defence of the islands has gone from being an essentially naval commitment in 1982 to a predominately RAF operation; the first line of defence of the island is the fighters, transport aircraft, logistics and air-to-air refuelling of the RAF. The construction since 1982 of Mount Pleasant, a major military facility and airbase 30 miles from Stanley, has transformed any attack-defence equation. Undoubtedly whosoever holds Mount Pleasant controls the island, and if lost to an invading force, Britain could not with twice the forces currently available retake the islands (clarify?). 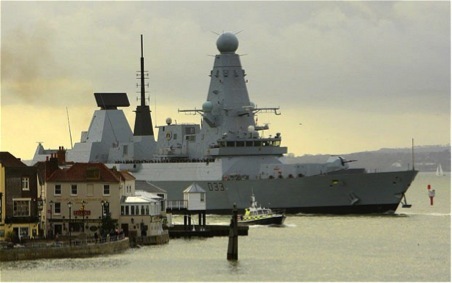 The 4 top of the range Typhoon fighters, infantry company, rapier air defence battery and supporting units which are typically based in the Falklands have been reinforced by an increased naval presence in the south Atlantic. With a mere 18 hours for reinforcements the islands are better protected from a military conflict than ever. The weakness of this plan is that it depends on the 24 hour warning and above all on maintaining control of the airport-the islands could not realistically be ‘recaptured’ if lost. However, such a weakness is not theoretically a problem, given the 400 miles of open water and air-space between Argentina and the islands a surprise attack is almost inconceivable. The defence of the islands militarily is only as strong as the will to defend them politically and that is something the British Government and all political parties are committed to. However, this is a defence strategy predicated on repelling military assault and yet the defence of the islands by military means is unlikely to do anything to defend the future of the islands from the much more successful blend of political and diplomatic pressure that the Argentinians and their south American allies can bring to bear on the UK and its allies. For this generation of politicians it is inconceivable and politically suicidal to consider the eventual ceding of the Falklands, and yet while the wounds are still too raw in Britain, the greatest threat to our ability to defend the islands is a test of strength of will. Whether the Falklands will remain British in 50 or 100 years is anyone’s guess but the likelihood is, that if they are not it will not have been because of an incapacity to defend the islands militarily.